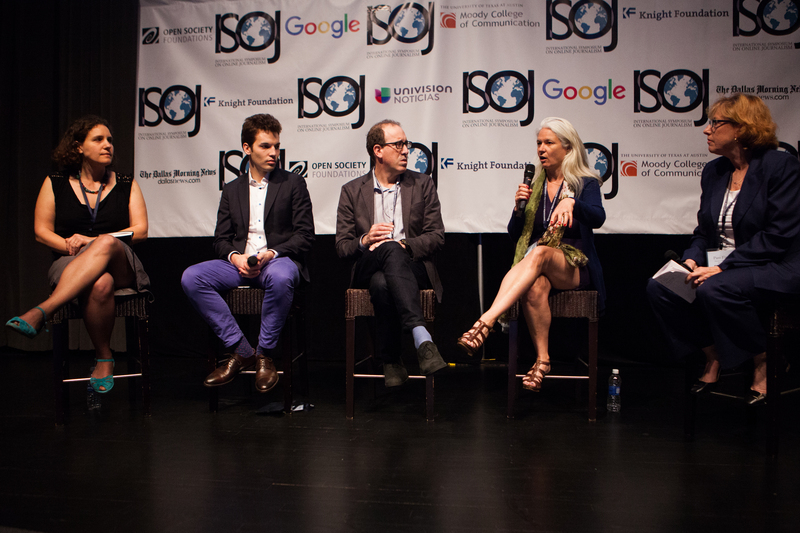 The question of what is the difference between journalism and activism animated the discussion during a panel at the International Symposium on Online Journalism (ISOJ) on Friday, April 15. Panelists agreed that although the line between the two has become harder to discern in the age of social media, there are still some important and key differences between journalists and activists. The discussion was kicked off by panel chair Pam Fine, president of the American Society of News Editors (ASNE), journalism professor at the University of Kansas, and Knight Chair for News, Leadership and Community. Fine highlighted how the emphasis for journalists has changed over time — from stressing objectivity to “striving to be fair and accurate.” However, with social media, readers’ expectations have also shifted — especially millennials, people born between the early 1980s and the early 2000s. Joel Simon, executive director of the Committee to Protect Journalists (CPJ), began by talking about why different stakeholders care about the differences between journalists and activists — highlighting that it has never been easy to make the determination given that the distinction is highly based on context. Furthermore, what journalists do may not be indistinguishable from the work done by activists. Jake Horowitz, founder of Mic.com, echoed this sense of blurring of the two categories, while still stressing that the distinction matters. He underlined how social media has played a large role in making the differences less clear, especially as journalists use different platforms to report and compile stories. For advocates, there are also a lot of similarities between their work and that of journalists. Emma Daly, the communications director at Human Rights Watch, said the on-the-ground work of the organization’s researchers looks a lot like that of journalists. For Daly, the ultimate distinction has to do with what happens after information is disseminated. “We produce journalism, but we aren’t journalists. We don’t stop at the story, we push recommendations for how to fix the problem,” she said. Daniela Gerson, community engagement editor for the Los Angeles Times, highlighted the ways in which her media outlet is borrowing tools from advocacy to give perspectives that would otherwise not be represented, while still striving to present both sides. The Los Angeles Times has been able to do this through integrating social media into its reporting process, according to Gerson. Although all panelists agreed that the line has blurred between advocacy and journalism with the emergence of the internet, Simon also pointed out how important context is. “If you operate in a country where repression and violence and intimidation are the name of the game everyday, then every day you are advocating on behalf of yourself and on behalf of your colleagues,” he said.